Unique little cabin home nestled in the Pike National Forest just Southwest of Denver. Primarily designed for two people (Only 1 queen bed), Cabin in the Pike will sleep four (one sofa sleeper). Both the bed and sofa are located adjacent to each other in an open loft. Located just seven miles west of Sedalia on Highway 67 and only minutes from Castle Rock, this quaint get-away is close to many of Colorado's finest attractions. Superb fishing in the Platte River, excellent hiking and mountain bike trails, combined with accessibility to Denver's nightlife make this a wonderful romantic hide-away. Only 45 minutes from Colorado Springs, attractions such as the Air Force Academy, Garden of the Gods, and Pikes Peak are top on your list of things to see. Rustic decor designed for adult clientele. Age restricted to children over 14 years. Please inquire if you have any questions. Your hosts, Tom and Deb have lived in the area since 2002, although Tom grew up just across the highway and knows the region quite well. After a 26 year career in the USAF, Tom and Deb decided to move back to his native roots. We love the area with so much beauty and peace. We just want to share this experience with everyone. This little cabin is located near our home, a mountain lodge (which we also rent out in the summer). Hiking fishing, white water rafting, mountain biking are all activities on or near the property. Just the views from the cabin's elevated deck offer the peace and quiet of mountain living. A unique setting, centrally located to many of Colorado's major attractions. Cabin in the Pike is perfect for relaxing in the sun at the pool, or setting out on day excursions for Colorado's best sight seeing. Take a bath in our jacuzzi tub while looking out a huge picture window to the mountainside flora. Unique stone shower. Beautiful cabin nestled in the firs, pines and aspen. Note: Cell phone coverage is limited. We can provide instructions to overcome this issue. Detergent provided. The is a High Efficient (HE) machine. Please, no softener sheets as it is a High Efficiency Machine. All the amenities you'll ever need. Views galore, both inside and out. Wrap around with plenty of room for sunning, dining and privacy. Note: the cabin is located approximately 7500 feet above sea level. Access to the doors is made via a long stair case. Pool is shared with our Lodge Rental. Jacuzzi Tub. Pool Jacuzzi is not heated. DirectTV, computer and printing (Note: Provided computer is not WiFi capable. You must bring your own laptop to access the mountain WiFi), Full Assortment of Kitchen Appliances, Linens provided and laundered for you, Picnic area, NOTE, DirectTV includes over 100 channels for your viewing enjoyment. Full Internet Access!!! Just bring your laptop or mobile device and log on. If you are looking for the best place to stay in CO. this is it!!!!!! Peace and quiet, beautiful nature and everything you could possibly need in the cabin!! The bed was very comfortable. It has central air and a fireplace. Lots of fans. I loved that I could do all our laundry before we left. We stayed 2 weeks and absolutely hated to leave. I recommend this cabin over anything else!!!! Thanks so much for staying with us!! Come visit again!! The cabin is absolutely gorgeous! We wanted a quiet cabin the woods but still have the option to go to stores and restaurants if we wanted. Castle Rock is only about 20 minutes away and has everything you could want including a huge outlet mall but the cabin has trails right outside your door. It’s comfortable and perfect! Gorgeous views as well! Thanks so much for the kind words. We are so glad you had a good time. Come back soon. We had a great experience at the cabin. We were able to see lots of wildlife right outside our window. The location was cool, tucked in the mountainside yet close enough to town. We hiked Devils head which was a short amazing drive away, highly recommend. The weather was not in our favor to use the pool but it was clean and nice, maybe next time. We will absolutely be back to this cabin. Thank you! Thanks so much for staying with us and for the awesome review! See you again sometime! This was our second stay at Cabin in the Pike; and it was just as enjoyable as the first. Tom and Deb are gracious hosts, who are in the background, but right there if you need them. The quiet and beauty of the surroundings make for a truly relaxing vacation. It's nice to get back to pure nature and away from the hustle and bustle of everyday life. You have too slow down, look around, and soak in the atmosphere of Cabin in the Pike. The cabin has all the conveniences needed to just stay there and sit and enjoy. I've always felt vacations had to be constantly moving, but Cabin in the Pike has proved me wrong. It close enough to major cities and shopping, but hidden enough to be out in nature. Would I recommend this vacation to others? Yes! Sincerely, Jerry & Marilyn B. We really enjoyed our stay at this cozy cabin. We brought our two dogs with us and found some great dog-friendly patios and a great dog park not far away. The cabin is close to Castle Rock and not far from Denver or Colorado Springs. Great hiking out the door as well. Cabin is well equipped and we spent hours out on the deck every day. The pool was a little cold but is a very nice area. Sedalia itself has some great restaurants but Bud’s is a must. If I had anything negative to say about the place, it would be the noise level from the road. Lots of truck traffic and loud motorcycles. Could be that is was the holiday week so may have been more traffic than usual. 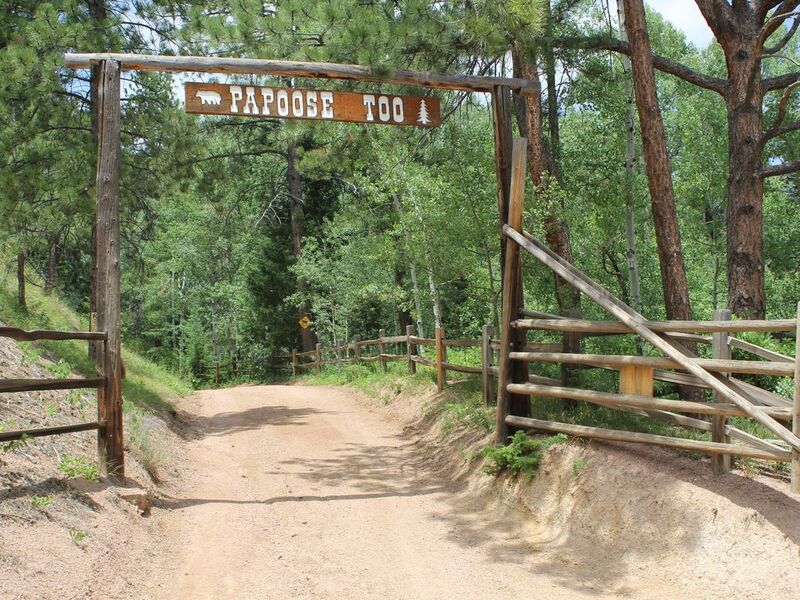 Cabin in the Pike is located just 7 miles west of Sedalia on CO State Hwy 67 in the beautiful Jarre Canyon. We are just 8 miles from the South Fork of the South Platte River. The cabin sits directly between Denver and Colorado Springs, offering each of their sights and activities in under an hour's drive. Denver, to the north, offers Red Rocks Amphitheater, Six Flags at Elitches, Golden and the Coors Brewery, and Rockies baseball. Colorado Springs, just 45 minutes south, offers the Air Force Academy, Garden of the Gods, Manitou Springs, Pikes Peak, and the North Pole. Please note: Please fill out and send the guest agreement that will be attached to your inquiry. All requests with the signed agreement will be expeditiously processed.